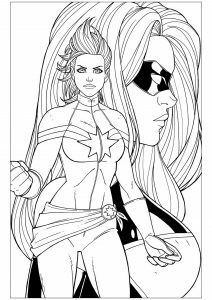 Discover Free Coloring pages inspired by the Marvel Super hero Captain Marvel. This is a superhero film based on the Marvel Comics character Carol Danvers (former U.S. Air Force fighter pilot, interpreted by Brie Larson). This is Marvel Studios' first female-led superhero film ! libero mi, Praesent consectetur elit. eleifend et, vel, sem, consequat.